Yay! The reveal for the Bead Peeps Swap and Hop has finally arrived. This hop is hosted by Linda Anderson and the Bead Peeps Facebook group. 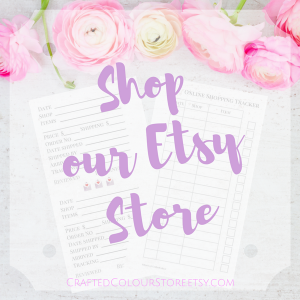 Participants for this blog hop were paired up and asked to exchange a selection of artisan beads and reveal their final handmade jewellery designs today! My partner this time around is Robin Kae Reed of Artistry HCBD, a US jewellery designer who makes gorgeous pieces with lots of gemstone beads and lovely charms. I can’t wait to see what she has made using the beads I sent her! Robin sent me a beautiful selection of clasps and gemstone beads along with lovely artisan buttons, including some letter “K” charms. 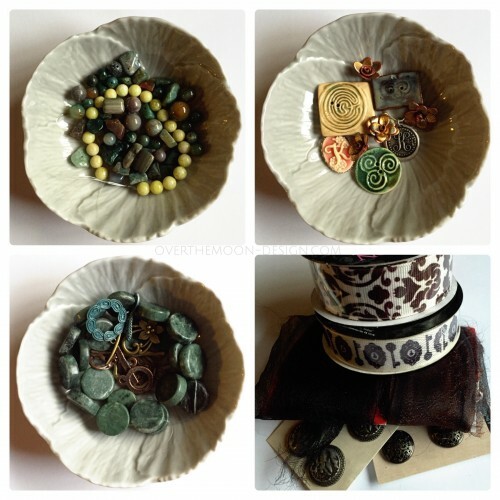 I was very happy with this lovely collection of gemstones, buttons and charms as I had just ordered and received a reel of my favourite chain and two quite large spools of vintage bronze wire that I was eager to use. I sketched out my designs and “shopped” my stash for a few beads to compliment the gemstones that Robin sent and decided to wait for a nice child free day to assemble my pieces. Of course, you can guess what happened, I misplaced my wire spools and couldn’t find the chain! I suppose I could have used copper but I really wanted that buttery caramel look you get from vintage bronze. I searched high and low, the real kind of search that we women do, not the “bloke-y look” that men looking for their keys tend to do. I ended up not finding the wire and ran out of time so here are what I have today. I used a button from Robin and some thread and picasso seed beads to crochet a wrap bracelet. When I find my wire I intend to add some of the gemstone chips on jump rings along the length and some tiny key charms. Here I wired some peacock freshwater pearls to another matching button and used my pliers to twist the wire to match the clasp, also from Robin. 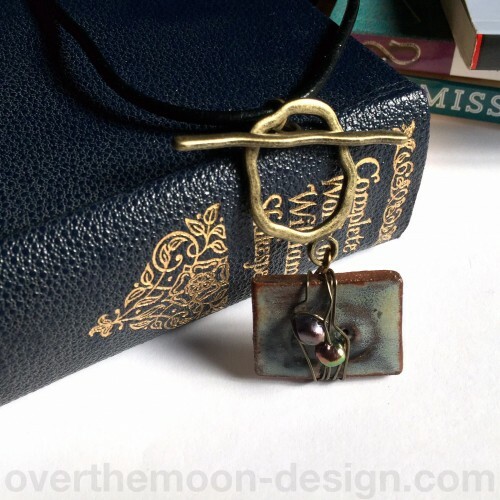 I threaded this pendant onto a leather necklace. I hope to make a beaded chain from the green (jasper I think?) gemstones and some blue grey agate I have. Finally, at the last moment I just had to make a scarf pin from the green jasper disks. I think I might have to patina the copper though. This one is going to go to my Mum for Mother’s Day next week, along with one of my crochet cashmere scarves (not pictured) and some lotion bars I made last week. Although the designs in my head didn’t eventuate they will be completed one way or another and I promise to show you updated versions of the pieces. To see what the other participants in the #BeadPeepsSwap created please check out the list here on Linda’s blog. Very cool! I can’t wait to see the bracelet once the gemstones & keys are added on! It looks great now, but I can just imagine how spectacular it will look then! Well i love what you made so far, the button bracelet is beautiful. The colours you used make me think of ocean corals. Your pin is really stunning. I love the different ways you used the buttons! I never would have thought to wrap it and use it as a pendant! Beautiful! Your designs are wonderful. I particularly like your crocheted bracelet. I am wondering how the button is attached. 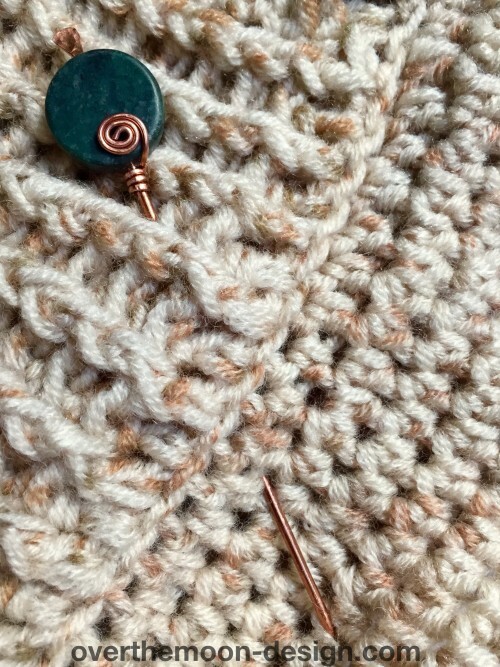 DId you crochet the wrap bracelet and then attach the button or did you work from the button out! 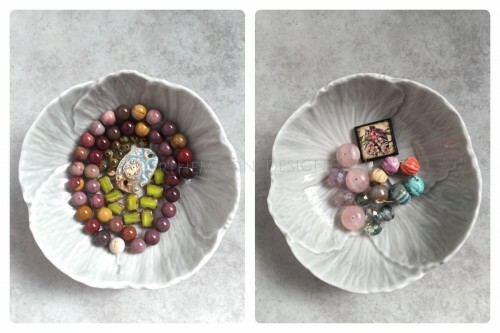 I have an art button that I would love to use in a bracelet similar to yours. I bet your mom will love her gifts. Anything handmade is so special. Great job on everything. Sounds like your mom is going to get a wonderful gift of handmade goodness. Very lucky mom. Your designs are lovely. I know what you mean about things you’ve just bought going missing. I hope the wire and chain come out of hiding soon. Really love the simplicity of the leather necklace. and that scarf pin is gorgeous! Nice job, I like the clasp, freshwater pearl piece. What a great use of the ceramic buttons. I would have been stumped by those. You used them beautifully. The scarf pin is very neat. Let us know when you have created the rest I would love to see what you come up with. wow love the crocheted bracelet. That sacrf pion is beautiful and what a great gift. Delicious bracelet! Great scarf pin. Beautiful! The crochet bracelet is fantastic and your mum is going to love that scarf pin. Beautiful pieces, I love the look of the crocheted wrap bracelet, and the way you wrapped the wire on the second button. Love the crochet bracelet .. all your pcs. are fabulous! I love that crocheted bracelet. Very very pretty! Well done! Your Mom is going to love the shawl pin ! The bracelet is really cool. Great job. The peacock pearls, wired to the button and attached to this cool clasp is my favorite piece – I still haven’t found a way to use a cool clasp as a necklace focal and always drool over pieces like this one! 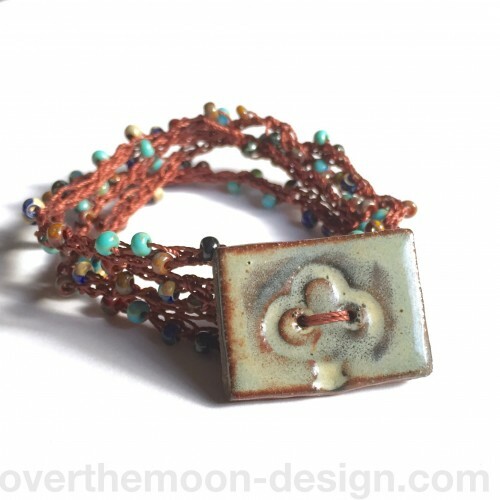 The bracelet came out beautifully – I’m glad the misplacement of the wire did not make you dump this project :) The pin is so pretty – I love swirls and, combined with the strong color of the bead, it makes a statement. Clever pieces, love the crocheted wrap bracelet! Beautiful pieces all around – love the ingenuity on all of them. The clasp as a focal as a frame for the button is very clever! Very pretty. It’s interesting to see how my Bead Soup Blog Party has morphed by Linda. Hi Karen, I bet your Mum loved the scarf pin. I do. It is very unique. The crocheted bracelet is pretty too. I think it will look wonderful when you find your wire and finish it to match the idea in your head. Great job.